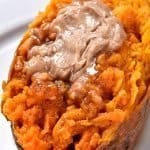 Instant Pot Sweet Potatoes Recipe - Cooking sweet potatoes in an Instant Pot or other electric pressure cooker makes cooking sweet potatoes so quick and easy! Perfect for enjoying as baked sweet potatoes as a side dish or for cooking to use in sweet potato casserole and so many other dishes! Place steamer basket in Instant Pot and add 1 cup water. Scrub sweet potatoes until skins are clean. Place on top of the steamer basket. Cover and place vent on lid to "Sealed". Set on "Steam" program and set time for 10 minutes. When finished cooking, don't open lid. Allow pressure to reduce naturally, about 25 minutes.